1943 Tuesday. They sent Dutch a Derrick Man from Coalinga first day out Today went To Gaity Show. Terrible. 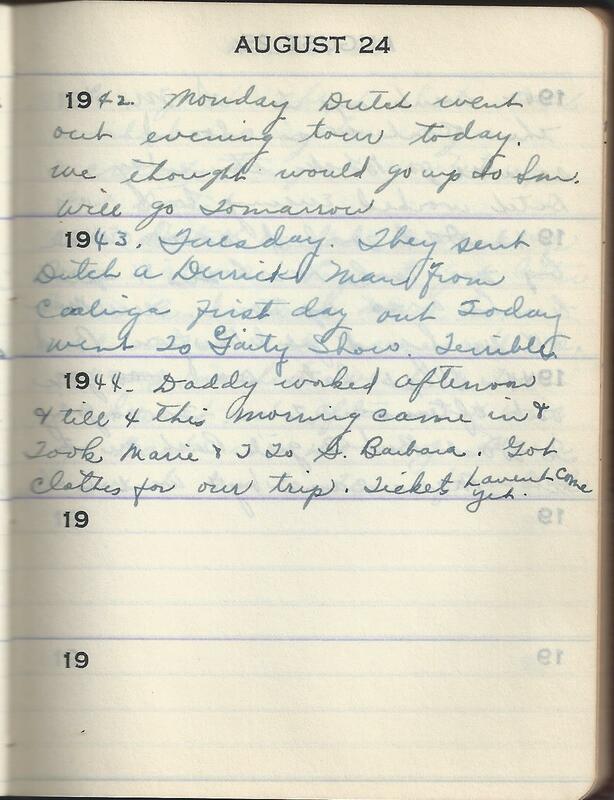 1944 Daddy worked afternoon & till 4 this morning came in & Took Marie & I To S. Barbara. Got clothes for our trip. Tickets havent come yet. 1944 entry: S. Barbara is Santa Barbara. Even when I was growing up Santa Barbara was THE place to go when you needed nice clothes. The trip they are preparing for is to go to Denver to see Bud. I have lots of wonderful pictures of them on that trip. This entry was posted in Tennant, Wright and tagged CA, Coalinga, Family history, genealogy, Martha Marie Tennant, Martha Marie Wright, Martha Marie Wright Tennant, Martha Tennant, Rene Baron, Sylvia Rene Stevens. Bookmark the permalink.